As we previously discussed on our blog and in our Digital Marketing Academy webinars, senior care reviews online are playing a significant role in helping consumers find the best service providers for their loved ones. Search engine-marketing agency BrightLocal reports that more than 90% of Internet users in the United States and Canada are reading reviews online during their product or service research. We’ve seen this level of engagement among senior care searchers as well: Consumers are clicking on business listings with senior care reviews and skipping those without them — whether they’re on a search engine page of listing results or researching in an online directory. Many family caregivers and older adults also tell us directly in periodic surveys that they find consumer reviews very useful to their research of senior care providers. The firsthand experience feedback in a senior care review provides insights about what current or former clients like (and dislike) about the senior living community or home care agency, and how the listed business may or may not meet their needs as a prospective client. Even those who get a referral from a doctor, hospital discharge planner, or social worker are still going online to find out what other consumers have said about that senior living community or home care agency — before picking up the phone to schedule a senior living community tour or in-home care assessment. 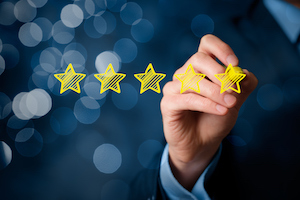 Given how much your target market is engaged with senior care reviews: You need to be actively monitoring and building your online reputation, as well as measuring the impact that reviews are having for your senior care business. We’ve helped some of our referral partners do this analysis through reviews in our online directory, and will share this data to help you measure the monetary value of an online review too. Read the senior living case study. Read the home care case study.